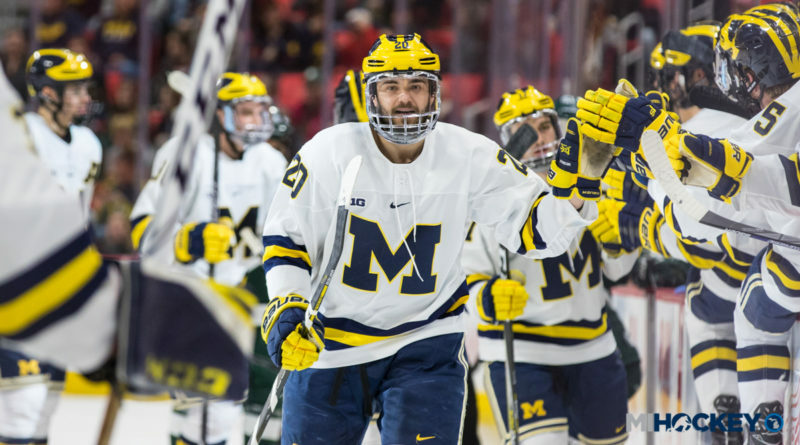 There is quite the Michigan flavor to the January monthly awards from the American Hockey League. The AHL announced Friday that Cooper Marody, Riley Barber and Alex Nedeljkovic are the three honorees for the first month of 2019. Marody, a Brighton native, recorded 13 points in 13 games for his Bakersfield Condors in January, which earned him the AHL rookie of the month honor. The University of Michigan product checks in at No. 5 among all AHL rookies in scoring this season with 32 points in 32 games. Barber, a longtime Compuware youth player and USA Hockey’s National Team Development Program alum, was named the player of the month after recording 14 points in 10 games for the Hershey Bears. He has 38 points in 38 games on the season. Nedeljkovic, a Belle Tire and Plymouth Whalers alum, posted a 6-0-0 record in January for the Charlotte Checkers, along with a 1.78 goals-against average, .937 save percentage and two shutouts. He also made his first NHL start during the month, recording 24 saves in a 5-2 win for the Carolina Hurricanes.